In March, this year, an exhibition of the paintings and sketches of Geoffrey Beling will be held at the Sapumal Foundation to mark his centenary birth anniversary which was on the 22nd September 2007. Geoffrey Beling was an artist of the '43 Group and also the architect and designer of the Lionel Wendt Arts Centre. Later he succeeded C.F. 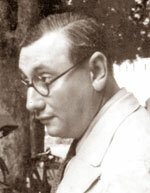 Winzer in 1932 as Chief Inspector of Art of the Education Department of Ceylon, which post he held until his retirement in 1967. Beling's best known paintings are in the galleries of the Lionel Wendt and the Sapumal Foundation, and in private collections both in Sri Lanka and abroad. The paintings which belong to his family, however, have rarely or never been exhibited. To commemorate the 100th year of his birth, Geoffrey Beling's family will share their collection with art lovers in Sri Lanka at an exhibition planned for March 14th and 15th 2008. The family's collection includes a number of delightful sketches by Geoffrey Beling in the year 1969 (his last compositions and, doubtless to say, invaluable to his family). Some paintings by his father - William Wright Beling - who was an artist before him, specializing in delicate water colours, as well as cartoons by Aubrey Collette who was also an artist of the '43 Group, will also be exhibited. Art lovers would not want to miss this unique exhibition.